What was once a rarity has become the norm in the luxury market. As in mainstream segments, the majority of U.S. buyers are now opting for utility vehicles, in some form or another. And even in traditionalist markets like China, the shift is gaining momentum. Globally, BMW expects the 7-Series to still outsell the X7 – for now – but it’s only a matter of time until the ute topples the king-of-the-hill. 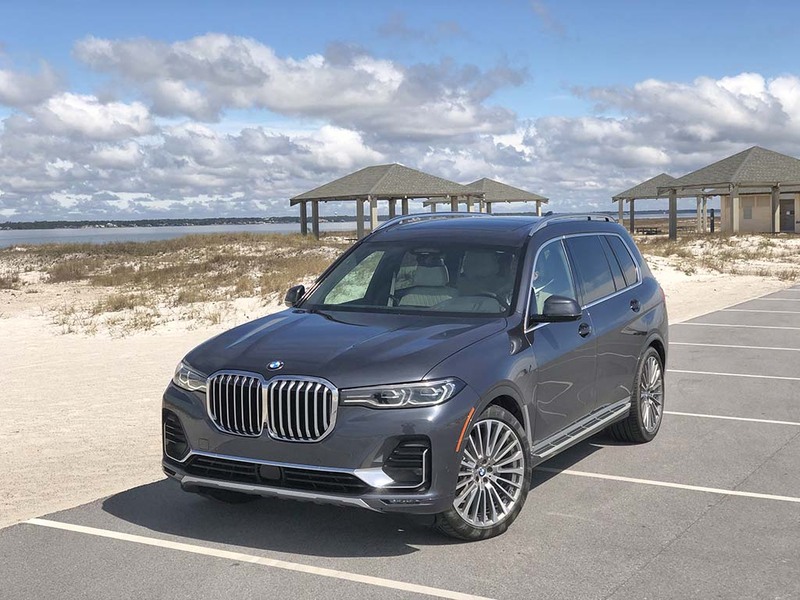 The X7, shown here on the beach in Pensacola, FL, has BMW's largest-ever double-kidney grille. BMW is relatively late to the party when it comes to full-size luxury SUVs, a large and expanding segment filled with the likes of the Mercedes-Benz GLS, as well as Cadillac’s Escalade and Lincoln’s Navigator. Depending on how you view it, the X7 slots somewhere in-between the Navigator and the new Lincoln Aviator. Those are tough acts to follow and BMW buyers are going to expect a lot out of the new, full-size SUV…er, SAV. The good news is that, for the most part, the Bavarians have delivered, though we do have a few quibbles after spending nearly 500 miles behind the wheel. Available in either six- or seven-seat configuration, the X7 measures 203.3 inches, nose-to-tail, the X7 is almost exactly the length of a Navigator or Escalade. It’s 78.7 inches wide and 71.1 inches tall, with a wheelbase of 122.2 inches. Depending on the configuration you choose, this behemoth weighs in at anywhere from 5,370 to 5,670 pounds. 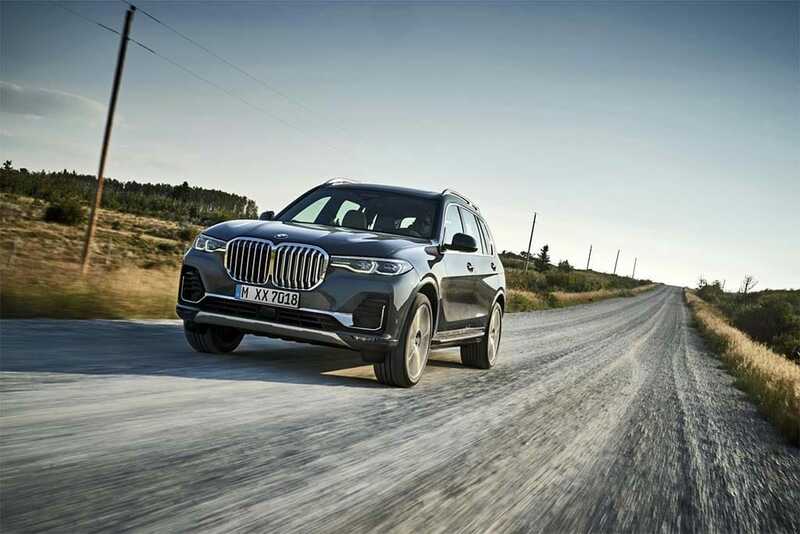 Visually, the new BMW is a formidable beast, with an even more solid and imposing shape than the recently redesigned X5, with an upright grille that would almost seem to fit on a locomotive but for the largest-ever kidney grille to appear on a BMW. The grille is framed, in sharp contrast, by almost slit-like LED headlamps. While BMW makes a point of saying the X7 is not a badge-engineered take on the Rolls-Royce Cullinan, the Bavarian ute has a similarly imposing presence. Take me to your leader? 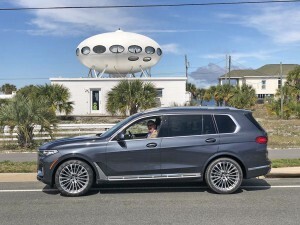 The BMW X7 checks out the Panhandle "Futuro" house. From a side profile, the 2019 X7 avoids the coupe-like roofline that has become something of an industry cliché these day – its silhouette allowing for massive windows fore and aft, and for plenty of headroom for even third-row passengers. Better yet, the rear doors are actually larger than those up front, making for particularly easy access wherever you sit. Inside, the new ute features the sort of luxurious appointments you’d expect of a BMW flagship, but on a massive scale. Those third-row seats don’t qualify as a penalty box here. And, with an optional rear panoramic sunroof, occupants in all three rows will get plenty of sunlight. But the centerpiece will likely be the massive twin displays, a 12.3-inch virtual gauge cluster and an equal-sized infotainment screen. 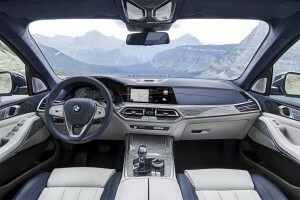 BMW was a pioneer in the infotainment world with its original iDrive, and while it’s tweaked its technology over the years, the rotary controller remains. But the automaker has expanded the system’s capabilities with the addition of its new voice assistant technology – which arrives about the same time as the similar MBUX system being launched by Mercedes-Benz. We found the Alexa-like system worked reasonably well though, like Amazon’s voice assistant, it would occasionally confound us by failing to work as expected or simply not responding. The 2019 BMW X7 will be offered with two engine options in the US, but a plug-in may follow. Like the 7-Series, meanwhile, the X7 adopts an updated version of BMW’s gesture control system which lets you do things like adjusting volume or changing stations simply with a hand movement. We found it as frustrating in the bit ute as in the sedan. Yes, once you learn the basics you can get it to do what you want almost all the time. But, if you’re someone who considers hand gestures an essential adjunct to speaking, be prepared to constantly have to reset the volume and switch back to your preferred station. Few automakers have become so enamored of technology as BMW, and the list of advanced features found on the 2019 X7 is a long one that would require several more pages to cover. So, to highlight just a few more, the vehicle also includes a broad array of advanced driver assistance systems, ranging from blind spot detection to Extended Traffic Jam Assistant, the latter allowing allows semi-autonomous driving on limited access highways. It proved particularly useful on those broad, flat stretches of Interstate through Alabama and Mississippi. Our test vehicle was equipped with the optional Driving Assistance Professional package and, for the most part, it did what it promised – but for a few times when we found the lane-centering system suddenly veering us off towards the adjoining lane. Consider it one of the reasons why BMW (like its key competitors) tells you it’s not a true hands-free system and reminds you to always be ready to take control at a moment’s notice. The instrument panel of the X7 is dominated by twin video screens. 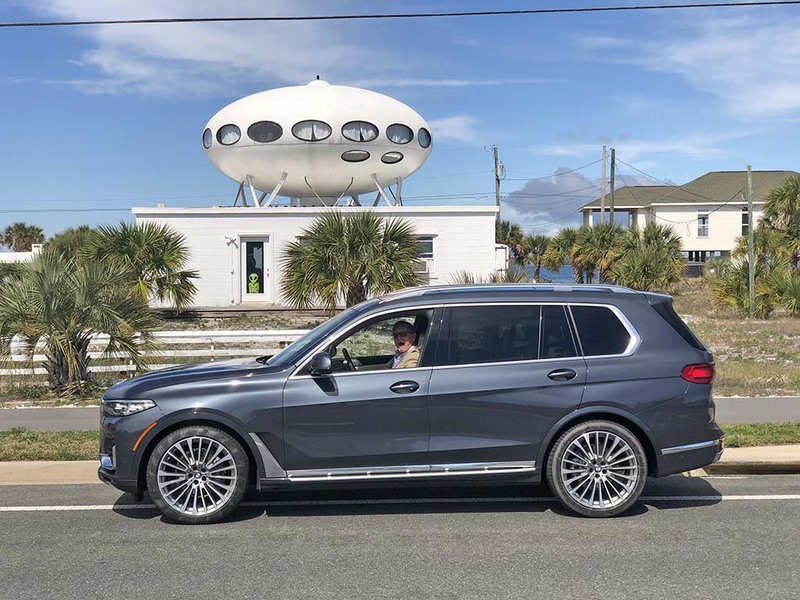 With little in the way of elevation changes along the way, we opted for the BMW X7 xDrive40i, a turbocharged inline-six making 335 horsepower and 330 pound-feet of torque. While there are a range of gas and diesel engines available in various global markets, there are only two rolling into U.S. showrooms for now. The alternative is the xDrive50i package, with its twin-turbo V-8 slamming out an even more hefty 456 hp and 479 lb-ft. Both engines are paired to the same eight-speed automatic gearbox and, as the xDrive designation suggests, send power to all four wheels. Considering the heft of the 2019 BMW X7, the 5.2-second launch of the X7 xDrive50i is impressive, the 5.8 seconds required by the xDrive40i only slightly less so. BMW last month confirmed plans for a 7-Series plug-in hybrid pairing a 3.0-liter I-6 with a single electric motor. 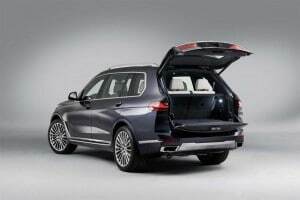 Company officials have been coy about plans to offer that package in the X7 but it appears all but a certainty – and would be well received. In the lighter, more aerodynamic 7-er, it can launch from to 60 in a mere 4.9 seconds and yields 34 miles per charge. The heavier ute would almost certainly be slower – but it might also allow the space to tuck in an even larger battery pack than the 12-kilowatt system in the sedan. We hope to hear more later this year. Open wide: a look inside the three-row, 2019 BMW X7's cargo hold. Our time in the X7 followed shortly after we had the chance to drive in the latest-generation BMW X5. The smaller crossover is itself an impressive package, handsome, well-equipped – and surprisingly capable of handling real off-road conditions, as we discovered during a couple of hours tramping along some well-worn Georgia trails. We’d have liked spending time testing the X7 under similar conditions but that wasn’t an opportunity on our Florida to Louisiana journey. That said, the BMW engineering team claims that the bigger sport-activity vehicle has many of the same basic features and offers similar capabilities, should you want to risk scratching up its deeply lacquered paint finish. The double air suspension has a dual purpose. It can be used to raise the X7 up, adding useful ground clearance, as needed, or to lower it down for clamboring in and out of the tall vehicle. The system automatically adjusts height as you get up to highway speeds. The driver mode system controls a range of vehicle functions, including steering, throttle response, shifting and ride dynamics. The X7 can feel a bit ponderous in its most comfortable setting, trading handling for ride comfort. It hunkers down nicely in the sport settings, however. As you’d expect of a utility vehicle in this class, it readily soaks up the miles, even more so if you switch on the massaging seats function then fire up the infotainment system. If we had any surprise it was the higher-than-expected levels of wind and tire noise, the latter perhaps compounded by the 22-inch rubber on our test vehicle. It’s by no means deafening and you’ll still be able to talk to third-row passengers without raising your voice much, but it’s clearly not the tomb-like silence of a Lexus LX. That said, we easily could’ve kept going all the way to Texas if we didn’t have an appointment to keep in New Orleans. Mardi Gras comes but once a year, after all. The X7 xDrive40i starts at $74,895, the xDrive50i at $93,595. As outfitted, our six-cylinder test vehicle ran $100,995 and the V-8 models BMW was offering other journalists pushed well above $120,000. 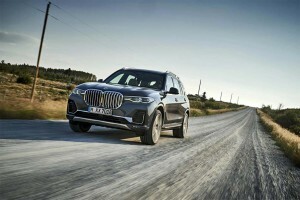 It’s not cheap, but based on our initial experience in the 2019 BMW X7 we expect it to generate a solid response from potential buyers. We’d be surprised, in fact, if dealers don’t start taking a lot of 7-Series sedans in trade. The X7 isn’t perfect, but it has a lot of things going for it and competitors like Mercedes, Lexus and Audi, never mind Lincoln and Cadillac, should be concerned by its debut. 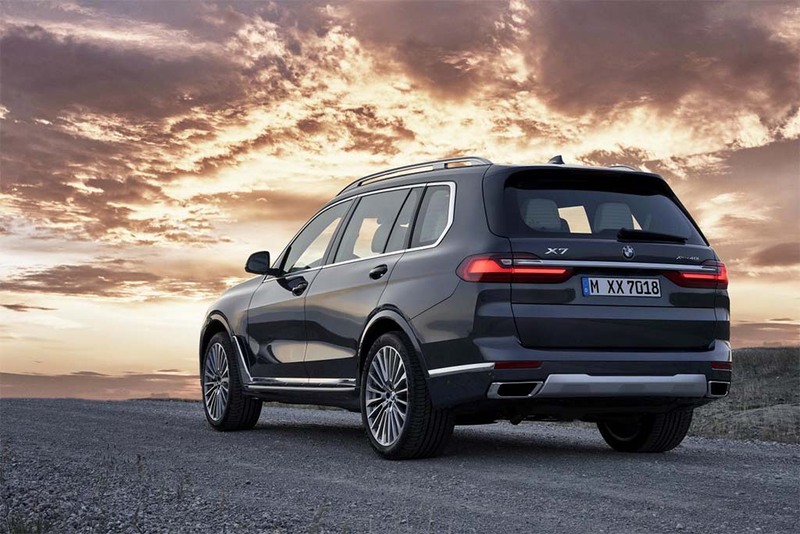 This entry was posted on Thursday, March 21st, 2019 at and is filed under Audi, Automakers, Automobiles, BMW, Business, Cadillac, Crossovers/CUVs, Electrified Vehicles, First Drive, First Look, Infotainment, Lexus, Lincoln, Markets, Mercedes, Reviews, SUVs, Sales, Sales, Semi-autonomous Driving, Technology, Trends. You can follow any responses to this entry through the RSS 2.0 feed. Both comments and pings are currently closed. Funny, I just saw a show on History Channel that said dinosaur extinction occurred 66 million years ago. I guess a few are still breeding. If I had $120K to spend on a car, this would be my last option (how about 3 or 4 Miatas). Is there any common sense left in car purchasing?